Title: PAID SICK DAYS FOR ALL WORKERS! 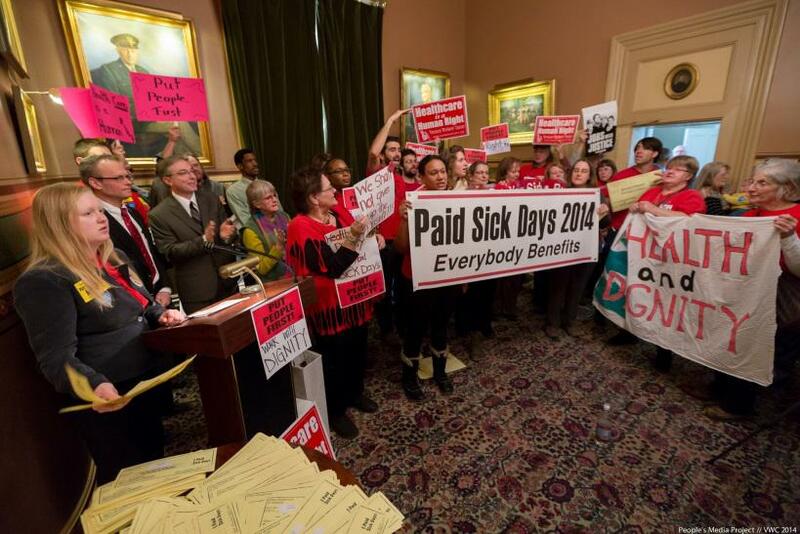 PAID SICK DAYS FOR ALL WORKERS! Moretown VT February 2014 -We, in each of our towns and throughout the Mad River Valley, are together a community . As town meeting approaches, I trust that all of us, regardless of our particular political persuasions, agree. And, as a community, we do right to concur that one does well when one’s neighbor does well. This commitment to our friends, family and fellow residents is an old one. When the Green Mountain Boys evicted New York land surveyors, tax collectors and sheriffs, I do not doubt that they too were motivated by this notion of self-preservation as inalienably linked to community; Freedom and Unity. More recently, we saw this belief manifest during the crisis following Hurricane Irene. Two and one half years ago I was honored to see many of you from Waitsfield, Warren, Duxbury, Fayston and beyond coming to lend a hand in Moretown during our hour of need. Such acts of human camaraderie will never be forgotten. In essence, Vermont has a long and proud history of people reaching out in solidarity when their neighbors could use a hand. We are, in a word, a people who embrace and honor the core value associated with the very notion of community as the foundation upon which rests the prosperity of the individual. Today, we can and do express our sense of community, not only in time of crisis, but also through a maturing social compact which gives form to the worth and well-being of our fellow citizens. Maintaining and improving an equitable education system that gives support to children and families is one such expression. Creating a Vermont controlled health care system that provides insurance and quality medical care regardless of job or lot in life is also such an expression. Guaranteeing that all working Vermonters are afforded the right to accrue paid sick days is yet another. It is for these reasons that I support H.208, a bill currently in the Vermont House of Representatives that would guarantee all Vermonters the right to earn up to seven sick days in a given year. As your neighbor, I encourage you to support this noble effort too. The fact is, all people get sick some time or another, most of us a few times a year. When this happens, when one has a fever, one should be able to stay home for a day and get better. And if your kid is home sick, and if both parents have to work, one parent should be afforded the economic ability to care for the child during that time of need. How could one begin to construct a moral argument against this statement? Either we are a community, and therefore embody the core truth inherent in the principle which is Vermont, or we are not. I assert that we are Vermonters. However, the reality is that thousands of low-income people in these green hills do not have any paid sick days. When they get sick, they often must make a hard decision: work while their body and mind are turned against them, or stay home and miss one fifth of their weekly pay. For the many, this one few-and-far-between unpaid sick day means the phone will be shut off; the rent will be late; the kids will miss a meal. For those that do work when they are ill, not only does their productivity go down, but they typically infect their co-workers which, in turn, makes productivity sink measurably lower. Therefore, as a community and as Vermonters, it is absurd to maintain a status quo which serves no human, neighborly or long-term interest. For these and other reasons, H.208 (paid sick days) is supported by both Vermont Businesses for Social Responsibility and organized labor. As a resident of Moretown, as part of the broader Valley community, I encourage all of you to take a moment to reflect on this human issue. I encourage you to express your support for H.208. I also encourage our two state representatives, Maxine Grad and Adam Greshin, to actively support this bill with no exemptions. I also call upon our governor and Washington County Senate delegation to likewise support this legislation. By doing so, they will all be casting a vote in favor of the Valley’s working families and in line with Vermont’s long tradition of valuing our community over short term and private interests. After all, one does well, when one’s neighbor does well. *David Van Deusen is the elected First Constable of Moretown and the Chair of the Moretown Progressive Party Caucus. He is a former Moretown Selectman & co-founded the Green Mountain Anarchist Collective in 2000. This article was first printed in the Times Argus, February, 2014. Legislation mandating that all Vermont workers have the right to accrue up to 40 hours of paid sick leave passed the VT General Assembly and was signed into law by Democratic Governor Peter Shumlin in 2016.